An in-depth breakdown of Streamsong Black’s short par four 2nd. A look into the great green of the 8th hole at Pinehurst #2 and how it impacts play. A deep dive into Augusta National's short par 4 3rd. Examining the architecture behind the short par 4 fifth at the California Golf Club. A deep dive into the Alister MacKenzie gem, Northwood's par 4 2nd. A look at the beautiful par 3 8th at Mammoth Dunes. A deep dive into the hazard less 12th at the Mike DeVries designed Kingsley Club. Short par 3's are fun but treacherous. Although the thought of a hole-in-one often slips its way into a player's mind, short par 3's are typically penal holes. Their theme is “hit it or else.” To intimidate the skilled golfer, forced carries are often employed. It’s a useful tool that creates uncertainty with the game’s very best (see the 12th at Augusta), but presents an extreme and sometimes unrealistic challenge for golfers with a low trajectory shots (seniors, women, juniors). One unique version of the short par three can be found on the 9th at Sweetens Cove. It gives golfers of all skill levels a fair shake. Credit for this hole’s brilliant design and construction goes to Rob Collins and Tad King. 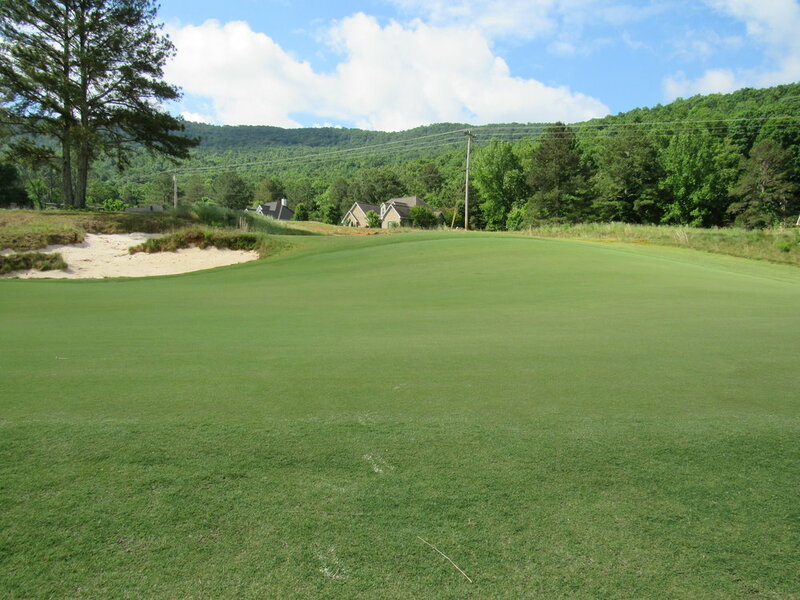 The duo utilized a redan slope - usually reserved for long par 3's - on a hole that requires an eight iron or less for the vast majority of golfers. It’s an idea that would cross very few architects minds because it’s a feature that has little purpose for the accomplished golfer. It’s a slope gives a low trajectory player a chance for something special. For longer players, the 9th plays like your traditional short hole hit it or else. A miss short right is met with an awkward chip over the massive redan slope. A short miss left or long, find treacherous bunkering. An average shot that finds the green complex leaves a challenging two putt. Likewise, a good shot yields an excellent birdie chance. The best golf holes offer alternative routes (options) for golfers. Sweetens 9th does that with its redan slope. It gives the lower trajectory player a shot at hitting it close or even in. A well executed low running shot up the right side will ride the slope down towards all pins. A shot not struck hard enough will find the same awkward pitch from the right side and one too strong will find the same back bunker. The difference between Sweeten's shortie and almost every other short par three is everyone has a real chance at a hole-in-one. Want proof? During a girl's high school golf match in August of 2016, back to back holes-in-one were had and followed with a closing hole in one to win the tournament. That's right, three holes-in-one, on the same hole and same day in a girl's high school match. A look at the oft-overlooked 14th at Pasatiempo. A thorough look at the design brilliance of Mountain Lake's short par 3 and the thumprint design. A deep dive into Coore & Crenshaw's sixth hole at Trinity Forest. A deep dive into the public access Donald Ross design Manakiki. In it's current state its a gem but it could be fantastic, a look at how their 2nd hole could easily improve. A deep dive into C.B. Macdonald's two shot redan hole at the St. Louis Country Club. A deep dive into the architectural brilliance of Sand Hills’ 18th. A weekly deep dive into some of America's greatest golf holes.